What's the Purpose of Rubber Boots? Rubber boots can keep you from slipping in the rain or snow. They can keep your feet warm and dry on a nasty day. Sometimes they're required for work. Other times you may want to wear a stylish pair for going out without messing up your nice, expensive shoes. They are good for work or play. Wear them on the job, hunting or even on a shopping trip if the weather calls for them. Use them to keep harmful materials from touching your feet or legs. Heck, use them to keep rain and mud off your skin. Allow them to help you keep your balance and avoid slipping with their gripping soles. Women can find quite a few cute rubber Rain Boots at Target. Wear them with anything; there are enough styles to create your own wardrobe. You might as well stock up here if you're living somewhere super rainy like Washington. The price is great. Check out Joule's collection of trendy boots for a glimpse of what all women's rubber boots should be. Try on a pair of Timberland Boots for work. They make waterproof boots suitable for work. You're less likely to slip, slide or have soggy socks and shoes. Try to stay away from the regular leather Timberlands if you're going to be caught in the rain or snow often. They'll look beaten and worn long before their time. Another brand of rubber boots made more for practicality than style is Gempler's. They offer a wide selection of men's, women's, knee boots, hip boots and more. Some boots don't fall into the style or work category, necessarily. They're a no-frills solution to nasty conditions. They're all about the function and not the fashion, nor are they necessarily important in the workplace. The Wellington boot falls into this category. 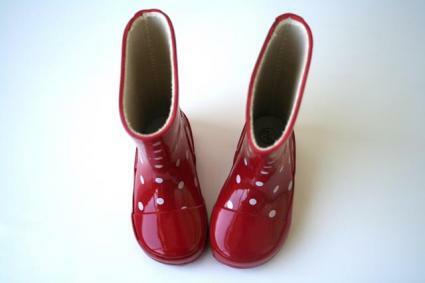 Children wear them to school in Canada when the snow begins to melt and the roads get slick and muddy. They're even lined with material to make your feet stay warm when the climate is cold. They can be worn at work, as well, to protect the legs and feet from chemicals. Mostly, though, they're a solution to nasty weather. Wellington DOES offer quite a few funky, fun boots that any woman would be proud to wear, but traditionally they're the black ones with colored soles. The Sierra Trading Post has rubber boots for men and women. The NoSox Myst Rain Boots for women are easy to pull on and off, and small enough to tuck away if you wear them to work in the rain and then the sun comes out by the afternoon. The Sierra Trading Post even has boots for men, the Kamik Defnse Rubber Boots. They're waterproof, have a neoprene lining for warmth and comfort and an adjustable strap at the top for a tight fit.